In this research, an in-depth analysis was conducted on log-linear model in order to examine the relationship between the crude oil and diesel prices. Generally, similar behavior may be observed between these variables. For this purpose, unit root analysis was conducted on time series data of log-linear model to examine if the series are stationary or non-stationary. The series also were analyzed using Engle-Granger Cointegration test to observe if they were co-integrated, and share the common stochastic trend. Moreover, ARDL (Autoregressive distributed lag) analysis was also conducted to examine the long-run relationship in this study. Monthly time series data between April 1994 and October 2017 of US crude oil and diesel prices have been used in this analysis. Empirical results clearly show that, the diesel and crude oil prices have the same trend and move in a similar way in time and there is an evidence that long-run relationship also exist. Akinboade, Oludele A., Emmanuel Ziramba, ve Wolassa L. Kumo. «The demand for gasoline in South Africa. An empirical analysis using co-integration techniques.» Energy Economics 30 (2008): 3222-3229. Atil, Ahmed, Amine Lahiani, ve Duc Khuong Nguyen. «Asymmetric and nonlinear pass-through of crude oil prices to gasoline and natural gas prices.» Energy Policy 65 (2014): 567-573. Bacon, R. Rockets & Feathers: The Asymmetric Speed of Adjustment of UK Retail Gasoline Prices to Cost Changes. Oxford Institute for Energy Studies, 1990. Bakhat, Mohcine, ve Klaas Würzburg. «Co-integration of Oil and Commodity Prices: A Comprehensive Approach.» Economics of energy WP FA05 (2013). Bentzen, Jan, ve Tom Engsted. «A revival of the autoregressive distributed lag model in estimating energy demand relationship.» Energy 26, no. Aarhus Schoolof Business, Fuglesangs alle 4, DK-8210 Aarhus V., Denmark (2001): 45-55. Block, Alexander Souza, Marcelo Brutti Righi, Sérgio Guilherme Schlender, ve Daniel Arruda Coronel. «Investigating dynamic conditional correlation between crude oil and fuels in no-linear framework: The financial and economic role of structural breaks.» Energy Economics 49 (January 2015): 23-32. Brown, Stephan P. A., ve Mine K. Yücel. «What Drives Natural Gas Pries?» International Association for Energy Economics 29 (2008): 45-60. Dranove, David. Practical Regression: Log vs. Linear Specification. Kellog School of Management: Northwestern University, 2012. Giles, Dave. Econometrics Beat: Dave Giles' Blog. 2013. http://davegiles.blogspot.co.cy/2013/06/ardl-models-part-ii-bounds-tests.html (erişildi: January 15, 2018). —. Econometrics Beat: Dave Giles' Blog. 2013. http://davegiles.blogspot.com.cy/2013/03/ardl-models-part-i.html (erişildi: January 15, 2018). Hamilton, James D. Historical Oil Shocks. University of California, San Diego, 2011. Karagiannis, Stelios, Yannis Panagoloulos, ve Prodromos Vlamis. «Are unleaded gasoline and diesel price adjustments symmetric? A compariosn of the four largest EU retail fuel markets.» Edonomic Modelling 48 (2015): 281-291. Moutinho, Victor, Joao Paulo Cerdeira Bento, ve Vladimir Hajko. «Price relationships between crude oil and transport fuels in the European Union before and after the 2008 financial crisis.» Utilities Policy 45 (2017): 76-83. Myers, Robert J., Stanley R. Johnson, Michael Helmar, ve Harry Baumes. «Long-Run and Short-Run Relationships between Petroleumi Ethanol and Natural Gas Prices.» 27 July 2015. http://ncfap.org (erişildi: December 15, 2017). Nielsen, Heino Bohn. «Coinegration and Common Trends.» 15 January 2017. (erişildi: December 13, 2017). Pesaran, M. Hashem, Yongcheol Shin, ve Richard J. Smith. «Bounds testing approaches to the analysis of level relationships.» Journal of Applied Econometrics 16 (2001): 286-326. Pokrivcak, Jan, ve Miroslava Rajcaniova. «Crude oil price variability and its impact on ethanol prices.» Agric. Econ. 57 (2011): 394-403. Wadud, Zia, Daniel J. Graham, ve Robert B. Noland. «A cointegration analysis of gasoline demand in the United States.» Applied Economics, 2009: 3327-3336. ISNAD ÇOBAN, Şebnem . "HOW CRUDE OIL PRICES AFFECT DIESEL PRICES IN UNITED STATES: AN EMPIRICAL ANALYSIS USING ARDL APPROACH". 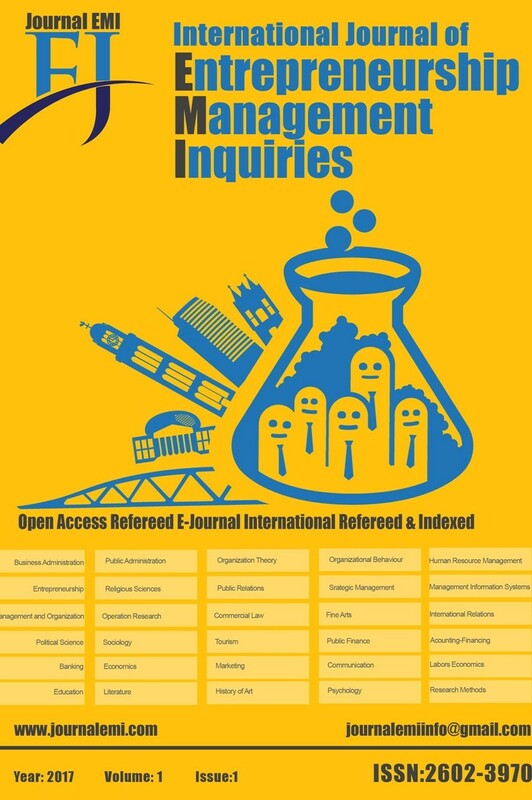 International Journal of Entrepreneurship & Management Inquiries (EMI) 2 / 3 (December 2018): 64-74.